During our tour of Belarus, you will become immersed in a mysterious culture, you will get to know the country and people off the beaten track and gain an understanding of what Belarus is all about: a wonderful, friendly and largely undiscovered country. Today you are travelling to Minsk. You will be picked up at the airport by your English-speaking guide. Once you have checked into your hotel, you will go for an evening stroll around town. After that you will have supper in a typical Belarusian restaurant and then visit the Belarusian National Library, where you will have a superb view of the night lights of Minsk from the roof-top. You will be accompanied by your guide and together you will talk through the programme for the next two weeks. Today you will learn more about the turbulent history of the country and Minsk, the Belarusian capital. Your guide will collect you from your hotel after breakfast and together you will walk around town seeing the sights. Your journey through time will start at the first stone church (10th/11th century) and will continue to the Orthodox and Catholic churches built between the 13th and 17th century in the old town centre. In the Troitskoye district you will be able to imagine what Minsk looked like in the 19th century. The town was almost completely destroyed during the Second World War and is still considered today to be the prime example of socialist realism. Unlike the cities of Moscow or Kiev, the entire city centre represents a harmonious ensemble in the gingerbread style of the Stalinist period, the likes of which can be found nowhere else in the world. The opera house, circus, Victory Square, main post office, GUM (state-owned department store), the building of the Ministry of State Security (alias KGB in Soviet times), the government buildings and many more, all bear imposing testimony to this style. They are all located on Independence Avenue, which constitutes the main hub of the city with its four large squares and adjoining parks. In addition to these sights you will also learn about the Jewish history of the town and visit what was the Jewish ghetto. From there it is not far to one of the largest and most beautiful parks in the city: the Victory Park. While wandering through the park you will see the pompous, newly-erected Museum of the Great Patriotic War (Russian term for the Second World War) on the south side of the park and on the north side the new residence of the Belarusian president, which is equally as impressive. After this eventful tour you will have lunch in a typical Soviet-style canteen (Russian: stolovaya), which is an experience in itself! After lunch, you will discover more interesting places in the town and glean an insight into how most of the Minsk population live, while driving through the suburbs. You will take a closer look at the working-class district around the Minsk Tractor Works. After the war, it was built in typical Stalinist style around the industrial complex and has barely been altered from an architectural point of view up to the present. Once, the state-owned tractor plant was the largest employer in the city, with a workforce of 40,000. Today it employs around 20,000 people. As of late afternoon you can explore the town on your own and your guide can give you further tips, depending on your interests. In the evening you might like to visit the State Opera, the ballet or a concert. Depending on the programme, we would be happy to arrange tickets for you. Today you will leave Minsk and travel northwards accompanied by your guide. After about 60 km comes the first stop, in Khatyn. Khatyn is a memorial site commemorating the 5,295 villages which were burnt down and destroyed by the German Wehrmacht during the Second World War. 186 of these villages were razed to the ground, burning all the inhabitants including women and children. The memorial site, which was planned by the renowned Belarusian architect Leonid Levin and opened in 1969, covers the entire area of the former village and is one of the most impressive monuments to the Second World War. Khatyn should not be confused with Katyn, located near Smolensk, where Polish officers were massacred on Stalin’s orders in 1940. Continuing in a northerly direction, you will arrive in the city of Vitebsk after another two hours’ journey. Vitebsk lies at the confluence of the rivers Vitba and Dvina. Thanks to its favourable location, the town was an important trading centre right from the time of the Kiev Rus (approximately 1000 years ago). Today, Vitebsk is one of the cultural centres in Belarus. In July the culture and song festival Slavianski Bazaar has taken place every year since 1992. If you decide to travel in July, we will gladly organise tickets to this event for you. Before you start out to explore, have lunch in an inviting beer garden in the city centre and enjoy the Vitebsk cuisine. Afterwards you can walk to the Uspenskaya Hill. This spreads out into a large park where you will find a monument to the Napoleonic Russian Campaign of 1812, which had a dramatic effect on Vitebsk. From there you can stroll along Suvorov Street to the carefully restored old part of town with its town hall which is well worth seeing. In terms of art history, Vitebsk is one of the most important places in Eastern Europe. From the end of the 19th to the middle of the 20th century such famous artists as Marc Chagall, Kasimir Malevich and Yuri (Yehuda) Pen lived and worked here. Ilya Repin, one of the most prominent representatives of the Russian school of realism, was often to be found in Vitebsk. They left their mark on many places in the city and you can find out more about their lives and work if you visit the Marc Chagall Art Centre. Vitebsk is also an interesting place from the point of view of religious history. On leaving the Art Centre, you will be able to learn more about this aspect and visit the most beautiful churches of the city including the Cathedral of the Intercession of the Virgin Mary which is the main cathedral of the archdiocese of Vitebsk, the Church of the Resurrection and the Catholic Church of St. Barbara. As our tour of discovery draws to a close, you will see the amphitheatre where the Slavianski Bazaar takes place. Finally you will stroll along Kirova Street in the direction of the main station beneath the festive illuminations which adorn it all year round. You will find your luggage waiting for you at your hotel – an architectural landmark from the 19th century – in a central location. In the evening you will be invited to eat with a local Vitebsk family. This meal will consist of homemade local specialities. While you indulge in home-distilled spirits made by your host, you will learn more about every-day life in Belarus. Your guide will help communication by translating for you. This day will be spent in the north of Belarus. After breakfast you will travel 100 km to Polotsk (White Russian: Polazk), which is the oldest Belarusian city, having existed for 1153 years. In the Middle Ages, Polotsk was the centre of one of the most powerful duchies on Slavic territory. In Polotsk you will be met by a nun who will be your guide in the convent of St. Euphrosyne, one of the oldest convents in Belarus. Part of the convent complex is the ancient Church of the Saviour from the 12th century in which partially restored frescoes and relics of the saints are preserved. Euphrosyne of Polotsk (1110-1173) was an important enlightener and patron of the arts and culture in the former Duchy of Polotsk. She is the patron saint of the White Russians. After this you will visit the old St. Sophia Cathedral (1044-1066), which was built as a copy of the Hagia Sophia in Constantinople and of the St. Sophia cathedrals in Kiev and Novgorod. Unfortunately it no longer exists in the original form: it is now a magnificent baroque church. Wandering further along the banks of the Dvina, you will discover two unusual monuments. One marks the geographical centre of Europe, which – according to the city elders – is supposedly located in Polotsk. The other is dedicated to the letter “ў” (Latin: ŭ, also called a short u), which only exists in the Belarusian language. 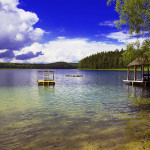 After lunch you will travel farther north to the Braslav Lakes. In the afternoon you will take up residence in a picturesque country estate directly on the banks of a crystal clear lake. You will spend a relaxing evening on the shores of the lake (depending on the season and weather) and your hostess will ply you with delicious fish dishes. Before sunset, you have the option of accompanying your host in the direction of the Lithuanian border to observe wildlife. If you are lucky you may see deer and elks, and if you are very lucky a bear. After breakfast you will get to know the surroundings of Braslav; picturesque lake landscapes and hilly countryside, something quite atypical for Belarus. For this reason the area is also called Belarusian Switzerland. In the summer one can do a sightseeing tour with a seaplane which affords spectacular views. You will have lunch in a restaurant directly by the lake. The owner, hunter and angler will prepare fresh fish dishes and game, including elk, for you. Our journey takes us further south westwards to Novogrudok. On the way we will stop in Glubokoe and Budslav. The Catholic churches here are well worth seeing; Budslav is the most important place of pilgrimage in Belarus. Afterwards you will continue to the little town of Ivje, also called the “Belarusian Jerusalem”. Ivje has always been a shining example for the peaceful coexistence of Jews, Moslems and Catholic and Orthodox Christians. This is reflected in the architecture of the town. You can visit the Catholic Church of Peter and Paul with its old Franciscan barefoot monastery, the Jewish Synagogue and a Tatar mosque. There we will meet the imam, who will show us around the mosque and explain how modern Tatar Moslems practice their faith. We will learn more about Tatar culture and customs afterwards when we are invited to have tea and biscuits with a Tatar couple. Towards evening we will arrive in Novogrudok, where we will spend the night. Novogrudok was the first capital of the Grand Duchy of Lithuania. Little remains of the former grandeur, only the ruins of the castle with its moat. But the town is nevertheless worth visiting. After breakfast you will take part in a tour of the city. It will take you through winding streets with colourful houses, which are quite uncharacteristic of Belarus, to the city centre with a castle and some interesting churches. The religious diversity is noticeable here too; in Novogrudok there is also an active Tatar community. You will come face to face with a relic of the Soviet past in the main square (Lenin Square), where a statue of Lenin stands to this day. Opposite the square is the city park, in which the former home (today a museum) of Adam Mickiewicz stands. Mickiewicz was actually born near Novogrudok yet he hardly wrote anything in Belarusian. But he is venerated by the Belarusian people and here you can find out why. To this day, both the Poles and the Belarusians claim Mickiewicz as their national poet. After lunch in Novogrudok you will continue your journey westwards to the provincial capital of Grodno. The city is known as the Belarusian door to the West as it lies only 15 km from the Polish border and 30 km from the Lithuanian border. Grodno can look back on 800 years of history, during which time it was part of various states and governed by different rulers. Thus different cultures and religions, past and present, have become entwined – which is what makes the city so special. A stroll will take you through the picturesque city centre, past the theatre to the two castles on the banks of the River Neman. The old castle was erected in the 14th century as the first fortress in the town and was plundered and burnt down on many occasions. Today all that remains is the palace, a fragment of the defensive walls and the ruins of the upper and lower churches. The new castle was erected as the summer residence of the Polish kings. The historic archaeological museum is housed here and bears witness to the turbulent history of the town. After the city tour you can relax on the banks of the River Neman and reflect on the events of the day. During dinner in a restaurant nearby you can tickle your palate with the regional cuisine, which has a distinct Polish influence. You will spend the night in Grodno in a hotel in central location. In the morning we will visit the Augustow Canal. It was built at the beginning of the 19th century and connects the River Vistula in Poland with the Neman in Belarus. This impressive industrial monument is one of the longest artificial waterways in Eastern Europe and is currently hoping to acquire UNESCO world heritage status. You will take a longer walk along the most beautiful part of the 20 km stretch on Belarusian territory. Boat trips are available on the canal between May and October. Before we turn back, we will pause for a picnic on the banks. Half-way back to Grodno we will visit the castle in Svyatsk. Off the beaten track, this castle stands majestically in the middle of the countryside – as if from another world. It was built in the year 1779 by an Italian architect for a family of Lithuanian aristocrats. Back in Grodno, we continue the short city tour of the previous day and concentrate on the diverse religious life in the city. Grodno is called “town of churches” and we are going to look at some of them more closely today. For example, the Orthodox Boris and Gleb Church, built in 1183 and the oldest building still in existence in Grodno. Then we will visit the Evangelical Lutheran Church and make the acquaintance of the local pastor. This will give us the opportunity to learn about Belarusian church history and how the religions coexist. We then continue along Sovietskaya Street, which is the main pedestrian area with picturesque merchants’ houses from the early 19th century and many little shops and cafés. At the end of the street, one comes to the main square where the St. Francis Cathedral is located, the largest Catholic church in the country. It is famous for its impressive wooden altar. And finally, we come to the turbulent and often tragic Jewish history of the town. Up until the outbreak of the First World War, about half the inhabitants of the town were Jewish. The central synagogue from the second half of the 19th century has been preserved to this day. During the Soviet period it stood empty. When Perestroika began in the 1990s, the building was given back to the Jewish community and is now almost completely restored. The head of the community will give us an insight into Judaism in Grodno and show us the adjoining little Museum of Jewish History. In the late afternoon we will leave the noise and hectic of the city behind us and travel northward in the direction of Brest and the Belovezhskaya National Park. We will stop off in Selyakhi, a beautiful remote country estate, where our hostess will give us a warm welcome and show us her extensive guest house before introducing us to the other inhabitants, horses, sheep and goats. The evening will be spent outside, in relaxed atmosphere on the terrace around a camp fire, enjoying a typical marinated meat and fish barbecue (Russian: schaschliki). Today you can sleep as long as you like, the only thing that could possibly wake you is the early morning birdsong. After an abundant breakfast you will be accompanied by your guide and a local ranger to a natural monument which is unique for Belarus, which is usually closed to visitors: the so-called Belarusian Maldives. These are two chalk quarries which have existed for over 100 years and have now been partially returned to nature. It is a fantastic sight to see the contrast of the kilometres of quarried chalk banks against the turquoise water. Our ranger will gladly tell you more about the history of the open pit mining and future plans for renaturation. After visiting the chalk quarries, you will make the acquaintance of Vera Mihailovna, one of the many courageous and determined women in Belarus. She is one of the few independent businesswomen in an otherwise strictly state- dominated agricultural sector and runs a goat farm with her son. She will show us the farm and invite you to help with milking. When the work is done, try a glass of fresh goat milk and enjoy bread freshly baked by the lady of the house, goats’ cheese and other specialities. From there we return to the country estate to relax for the rest of the day. After supper you may fancy going to the banya (Russian for sauna) and afterwards for a refreshing dip in the lake. Or if you feel so inclined, you can accompany your host, who is also a hunter, on a short foray into the nearby woods. After a hearty breakfast you will set off today to the Belovezhskaya Pushcha National Park (see more under “Belovezhskaya National Park”), which is the only remaining lowland virgin forest in Europe and is a UNESCO world heritage site. We will take you to the untouched, northern part of the park, where tourists do not normally go. There we will stop at a small country estate on the edge of the national park. The owner, Dimitri, is an acknowledged nature expert. He will take you on an excursion into the woods off the beaten track, to show you places and tracks known only to him. The biological diversity here is overwhelming: more than 5,000 types of plant and 3,000 types of fungus have been identified. If you are interested in wild animals, Dimitri will be pleased to take you into the woods at dawn where you may be lucky enough to see rare birds such as the black stork or the lesser spotted eagle or even the undisputed king of the park, the European bison. In 1920 they became extinct here, but today there are about 450 animals living wild in the park. In addition to all this, your host can tell you about the eventful and often tragic history of the park, from Napoleon’s Russian Campaign in 1812 to the tragic events in June 1941, when the area was one of the first to be occupied by German troops during Operation Barbarossa. You can spend the evening – depending on the season – on the veranda or in front of the fire-place in your host’s hut and titillate your taste buds with the culinary delicacies prepared by the lady of the house. This morning, we will be making an early start and turn southwards in the direction of Ruzhany, a little town which boasts an imposing castle from the 17th century. It was the residence of the aristocratic family of Sagegi who received their guests in this isolated spot. Although it is now somewhat derelict, it is nevertheless a stunning sight to see this castle in the middle of the countryside. Forty kilometres farther on is a town with a very similar name: Pruzhany. This likewise boasts an impressive building, a market hall from the 19th century, the likes of which are to be found nowhere in Belarus. It is built in a mixture of the baroque and classicist styles. The last remaining stately mansion built in the Italian style also stands in Pruzhany. The Romanovs, the family of the Russian Tsar often stayed here. While the Tsar went hunting in the Belovezhskaya Pushcha, the Tsarina held court. After having lunch in Pruzhany the journey continues to Brest. Your tour of discovery starts in the Park of the 1st May, at the entrance of which numerous Second World War monuments stand. In Brest there are many reminders and memorials dedicated to the Second World War. Brest was the first town to be attacked by the German army as part of Operation Barbarossa on 22nd June 1941. Leaving the park, you will come to the main square with an imposing ensemble of buildings in the Soviet neo-classical style. Continuing through the former Jewish ghetto, you will come to the pedestrian precinct where a lamplighter lights up the lanterns by hand every evening. Legend has it that if you touch a button of the lamplighter’s jacket and make a wish, the wish will come true. There is a proper lantern cult in Brest – no other Belarusian town has as many lanterns. In Gogol Street, every lantern is a work of art, devoted to a different theme. You will have supper in a local restaurant near your hotel which is in a central location in Brest. Before leaving Brest and continuing eastwards, we will visit the Brest fortress. It was built at the beginning of the 19th century to defend the town. In the Second World War the fortress was besieged by German troops and resulted in a legendary tale of heroism being fabricated by the Soviet Union. This legacy is still alive today and the memorial complex is one of the most frequently visited sights in Belarus. Now it is time to leave the region of Brest behind and continue eastwards in the direction of Minsk, in order to see two of the most impressive Belarusian buildings of historic importance. The first is the residence of the aristocratic family Radziwill in the town of Nyasvish. Together with the Catholic church, the castle forms an ensemble which is now part of the UNESCO World Heritage. While wandering around the town and the castle you will learn more about the turbulent history of the place. Afterwards we will have lunch in the famous Rathaus (town hall) restaurant. Just 30 kilometres from Nyasvish is one of the most beautiful Belarusian castles: Mir. It is surrounded by a quaint little town of the same name. The castle was built at the beginning of the 16th century and belonged to various noble families over the centuries. For the most part it belonged to the Radziwill family, under whose influence the castle achieved its greatest magnificence. One is reminded of this even today when you contemplate its grandeur, the thickness of the walls and the surrounding moat. Mir Castle is the most easterly Gothic site and the last architectural example of the vivid Belarusian Gothic. Its walls still hold the secrets and legends of the noble families. You will learn more as we stroll around the courtyard. In summer, various concerts and festivals take place in the castle or on the meadow in front of it. If you are lucky you may come across a touring exhibition of contemporary Belarusian art. Now you have been to nearly all the provinces in Belarus. All that remains is the south-east of the country around the towns of Mogilev (Belarusian Mahiljou) and Gomel. We set off in that direction in the afternoon. On the way we will pass places such as the town of Salihorsk, where you will see towering slag heaps. These bear witness to the decades of potash mining, on which the region depends. In the evening you will arrive at the little town of Lyuban, which is the administrative centre of the district of the same name. This evening Galina Wassilevna Solovyeva will welcome you to her house. Lyuban is a typical little Belarusian town with a population of around 11,000 inhabitants. Galina and her husband have worked for the administration as architects for over 35 years and are largely responsible for shaping the appearance of the little town. During an evening stroll through Lyuban they will tell you about the town’s development from the Soviet era to the present day. Back home, our hostess will serve a tasty dinner in the summer garden. Overnight stay in the Solovyevas’ house. After breakfast we will set off in the direction of the Pripyat National Park. This was founded in 1996 and extends both sides of the River Pripyat around the little town of Turov. The park landscape is characterised to a large extent by moor formations, which is the main reason for its unspoilt state. 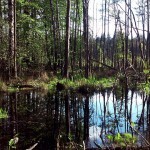 It is the habitat of many wild creatures and many threatened bird species nest here. For birdwatchers we offer a special tour for wildlife observation from mid April until the beginning of May. On reaching the Pripyat, your excursion will commence with a boat trip on the river. On the way through untouched riverscapes and oxbow lakes you will be able to observe numerous bird species and other river life. Back on land, you will take a short walk in the lowland moors. Your guide will familiarise you with the history of the moor and its flora and fauna. During the Soviet era, the moor was used for intensive farming and its existence was threatened by drainage. In the afternoon you will visit Turov, one of the oldest towns in the country dating back over one thousand years. The town was home to the tribe of Drehovichians. The Drehovichians were, together with the Krivichians and the Drevlyans, the original tribe from which present-day Belarusians descend. The picturesque little town, located directly on the Pripyat has several very old churches which one can visit, in particular a wooden Orthodox church which is typical of Polesia. In addition you will visit the castle hill, where the remains of a stone church from the 12th century can be seen. This was the home town of Cyril of Turov who was bishop of the first Roman Catholic diocese on Belarusian territory in the year 1005. An impressive monument was erected here in his honour. The neighbouring Orthodox cemetery is known throughout the country for three stones, which appear to grow out of the earth in the shape of a cross. In the evening we shall go to a country house located directly on the banks of the River Dnieper where our hostess will be waiting to welcome us with a freshly prepared fish dish. A new day is gradually dawning on the Dnieper. You will be woken by your host while it is still dark, at 5 o’clock in the morning. He will take you on a morning fishing trip in his boat. You will travel way out into the majestic Dnieper and while you hold your fishing rod in the water you will experience an unforgettable sunrise over the banks of the river. After 2-3 hours you will return with your catch and the fisherman’s wife will be waiting for you. She will turn the smaller fish into a delicious fish soup which you can enjoy for a substantial breakfast with a glass of vodka. After breakfast we will say goodbye to Polesia and southern Belarus. Your hostess will give you some homemade specialities for the journey and we move on north-westwards in the direction of Minsk. About half way there we will stop off in the town of Bobruisk (Belarusian: Babrujsk). Before the Second World War the town was an important centre of Jewish culture. There were 30 synagogues, which is why the town was popularly known as the capital of Israel. Your guide will tell you about the turbulent and tragic history of the town while you take a short walk through the centre and the huge food bazaar where there is something going on all year round. We leave Bobruisk and travel south-westwards. Immediately outside the town there is a large war cemetery, Shatkovo. To this day, the German War Graves Commission cares for the graves of German soldiers who fell during the Second World War in the areas around Vitebsk, Mogilev and Gomel. On the way to Minsk we will leave the surfaced road once again and drive to the unspoilt village of Sutin. Like all other villages in rural areas of Belarus, Sutin depends almost entirely on agriculture. The main employers are state-owned large-scale farms or kolkhozes. We shall meet the manager of the local kolkhoz. She will show us the farm and give us an insight into what the life of people in the country is really like. Then she will invite us home and will serve blinis (Russian pancakes) with home-made sour cream, pickled vegetables and meat made on the premises. Not forgetting a glass of home-distilled spirits. In the late afternoon we will embark on our journey back to Minsk where we will stay the night. Today you will bid Belarus farewell. Before your guide brings you to the airport you will have time to buy typical Belarusian souvenirs for your loved ones or just take a last stroll through Minsk.